It’s exciting to pay off debt. As you pay off credit cards, you enjoy that feeling of becoming financially free. But before you get so excited that you cancel your credit card, you need to take a step back. Is it really in your best interest to cancel your credit card? Total, you have $7,500 in available credit. Your credit utilization — the amount of credit you are using — is right around 51%. But what happens if you cancel that freshly paid off credit card? You are now using $3,800 of your $4,500 in available credit, dropping your credit utilization to almost 85%. This is not a good thing, and it can sabotage your credit score. 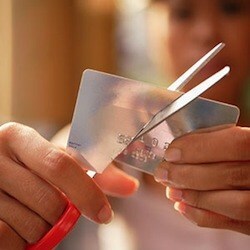 Another impact canceling a credit card can have is on the length of your credit history. While this isn’t as big a deal as your credit utilization, it still matters a little bit. Part of your credit history calculation is how long you have had your combine credit accounts. Dropping a credit card out of the equation makes it look as though you have a shorter credit history, especially if you have had your credit card for a long period of time. There are a number of ways your credit score can help you, even if you don’t plan to borrow, and it doesn’t make sense to ding your score. A credit card is a great tool when you travel. When it comes to reserving certain travel items (like a rental car), many companies prefer to have a credit card, and not a debit card. Holds placed when you check into hotels or rent cars can mess up your checking account, since the money is reserved, as if you’re going to spend it. Even if the amount that clears is different, for a few business days that money is unavailable to you. I find it easier just to use a credit card when I travel. Credit cards can also be handy in emergency situations when you travel. Many cards offer special services that can help you contact local tow-trucks if you need help in that way, and many of them come with rental car insurance. There’s no need to pay for extra coverage when you travel with a credit card. Credit cards come with some great protections. First of all, when your card is lost or stolen, and used fraudulently, you aren’t liable for purchases made. While this is often true with debit cards with credit card logos, the protection really isn’t the same. When the money is gone from a checking account, it’s gone — and you have to try to put it back. With a credit card, it’s not your money that’s gone. Your checking account isn’t touched. Credit cards also come with extended warranty protection and other protections. Some even come with price protection on purchases. If you use your credit card responsibly, there are a number of protections you can enjoy. Find the credit card that fits your needs. Check out our Credit Card Center for more tips and offers! Of course, one of the biggest reasons to keep your credit card is due to the rewards. You can earn cash back, free travel, and more. But you have to be savvy about your credit card use. Only charge what you know you can pay off. With the right plan, though, you can make all your regular purchases with a rewards credit card, pay off the balance each month, and reap the benefits. You enjoy these benefits without actually having to spend beyond what you had already planned. Before you decide to cancel your credit card, take a second look at the benefits. If you can bring your spending under control, and make a plan, credit cards can be a great way to help you boost your credit, and improve your finances. It’s been some time since we’ve cancelled a credit card. We only have three or four cards between the two of us so it’s not that big of a deal. We always pay off the bill in full each month, so the biggest thing we’d lose is the history aspect. I have a few credit cards I wouldn’t mind getting rid of. I agree that if you cut off a credit card that you’ve established a good history on that may take a notch off the score. I’d likely wouldn’t blink an eye of getting rid of cards that are newer and that I never use. I certainly wouldn’t be opening any more either, waste of time. I have 2 cards that I use and that’s more than enough for me. Seems to vary from person to person regarding credit score. Great points!